In Nationalism, Development and Ethnic Conflict in Sri Lanka, Rajesh Venugopal offers a fresh look at how colonial legacies, nationalist ideology and discourses of development have combined to shape the contours of Sri Lanka’s current tumultuous politics. This is a nuanced and authoritative analysis, writes Benjamin Brown, that provides a clear and lucid ‘big picture’ explanation of the ruptures that have characterised Sri Lanka’s recent history. If you are interested in this review, author Dr Rajesh Venugopal will be discussing his book at an upcoming LSE event on 22 January 2019. More information about the two-part event, including how to attend, can be found here. Nationalism, Development and Ethnic Conflict in Sri Lanka. Rajesh Venugopal. Cambridge University Press. 2018. ‘I have succeeded in uniting the territory. Now, I am entrusted with the task of uniting the hearts of all sections of our people. I willingly take over the noble task of creating peace among our communities.’ So claimed Sri Lanka’s former president Mahinda Rajapaksa, who led the military defeat of the Liberation Tamil Tigers of Eelam (LTTE) in the violent, bloody conclusion to a 26-year civil war. Yet, as events in 2018 have shown, the country remains beholden to a tenuous, unsettled peace, with sporadic outbreaks of violence and a government in crisis. Rajesh Venugopal, a political sociologist at the London School of Economics, is no stranger to this turbulent history, and his 2018 book Nationalism, Development and Ethnic Conflict in Sri Lanka offers a fresh look at how colonial legacies, nationalist ideology and discourses of development have combined to shape the contours of the nation’s current tumultuous politics. In this nuanced and authoritative analysis, Venugopal aims to shed light on two major, interrelated themes: ethnic reconciliation and economic reconstruction. Sri Lanka was once lauded as a postcolonial success story: a peaceful democratic nation amid the violent upheavals sweeping across what was then known as the ‘Third World’. Yet this image quickly turned sour as Sinhala nationalism came to dominate political affairs, to the growing disenchantment of the Tamil community. Venugopal expertly dissects how this ‘Sinhalisation’ was instrumentalised by elite actors, as the political morality of the Sinhala-Buddhist majority grew to assume hegemonic status. Transgression of this moral code, he argues, formed the basis for the legitimisation of acts of violence against minorities; elite-mass cleavages were obscured through the primacy of Sinhala nationalism, which provoked ethnic tensions and ultimately culminated in a devastating civil war. 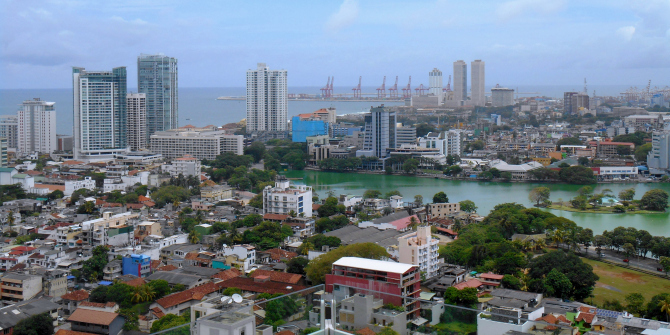 In tandem with his discussion of cultural politics, Venugopal provides an expansive overview of transformations in Sri Lanka’s political economy and social structure. From the outset, he ties the discursive mobilisation of development to ‘the contradictory process of the making, unmaking, and re-making of the social democratic state’ (11), addressing the decline of peasant agriculture and land fragmentation under colonial rule; the rise of a newly educated, under-employed class seeking government employment in the wake of independence; and, following the United National Party’s (UNP) election win in 1977, a programme of market liberalisation and state withdrawal in keeping with the tenets of neoliberal capitalism. To illustrate his argument, Venugopal draws on a broad range of demographic and socioeconomic data, convincingly articulating how communal tensions and economic factors moulded the development process. There is, however, limited attention paid to gender and ecology as sites of political intervention, without which any discussion of ‘development’ remains limited. It would have been interesting to know how gender norms have been inscribed in Tamil and Sinhala nationalisms, and greater engagement with feminist inquiry into social reproduction could enrich our understanding of Sri Lanka’s social structure. Similarly, I would be curious to know how the modernisation of the economy and violent conflict have left their mark on the landscape: ecologically disastrous projects such as the Mahaweli development programme are considered only in relation to the process of market reform and vicissitudes of electoral politics. Venugopal directs our attention to the paradoxes and idiosyncrasies found in Sri Lanka’s political system, which invert the traditional left-right axis to produce a ‘sectarian socialism’, fusing Sinhala nationalism with state welfarism, versus a ‘cosmopolitan capitalism’ that marries a liberal sensibility with a commitment to a pro-Western, neoliberal agenda. I was not entirely convinced by this typology – there was limited discussion of social movements or the extra-parliamentary left – but it is nevertheless helpful in understanding the cleavages animating party political affiliations. In the latter part of the book, the author tackles head-on the flawed assumption that economic incentives were sufficient to bring about peace. I found this discussion useful in explaining the ultimate failure of the 2002 ceasefire agreement that temporarily halted violence. What Venugopal terms ‘military fiscalism’ had generated employment and stimulated the war economy, but by explicitly tying the prospect of peace to the introduction of unpopular neoliberal policies – ‘a project intended primarily to bypass the social-democratic state’ (82) – the UNP government ensured public consent would not be forthcoming. Without support from the opposition Janatha Vimukthi Peramuna (JVP) party or the social base it represented, the peace process floundered. The final section of the book explores the legacy of Rajapaksa, whose authoritarian rule did little to dilute his popularity in the wake of a crushing military victory, allowing him to push forward with a programme of new ports, airports and expressways. For Rajapaksa, economic growth was considered an effective substitute for ethnic reconciliation, a precursor to today’s political paralysis and prevailing mood of discontent. At this critical juncture in Sri Lanka’s post-war history, Venugopal’s analysis could not be more timely and provides an essential companion to understand the events unfolding in the current political moment. 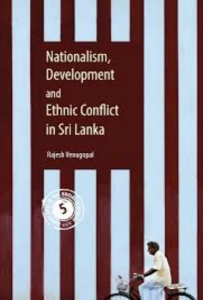 Whilst the book could have benefitted from greater attention to the performative dimensions of nationalism, development and ethnic conflict as they are lived out and enacted on a daily basis, it nevertheless offers a clear and lucid ‘big picture’ explanation of the ruptures that have characterised Sri Lanka’s recent history. In doing so, it provides an invaluable service by contextualising the political violence which has blighted the country, demystifying the often bewildering array of factors which induced ethnic conflict. Benjamin Brown holds a BA in International Development with Anthropology and Politics from the University of East Anglia, and an MSc in Environment and Development from the University of Edinburgh. Since January 2018, he has worked at the University of Edinburgh’s Institute of Geography, contributing to research on the territorial politics of road-building in post-war Sri Lanka.